Kouign amann is made in steps. Butter placed on measured square. 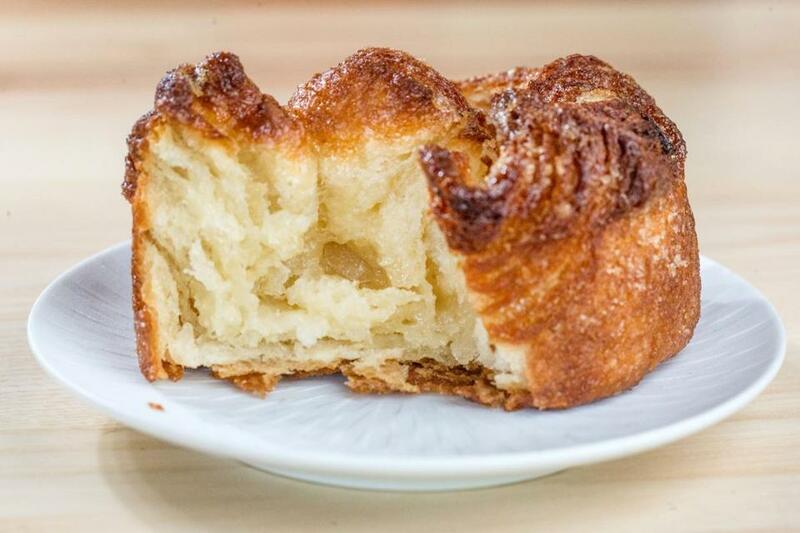 CAMBRIDGE — There are fads, like cronuts, and then there’s the French pastry kouign amann (pronounced kween ah-mahn). The Breton specialty isn’t new or singularly contrived; it’s lodged firmly in the patisserie tradition of northwestern France. It’s a classic, made in the region for 150 years. The pastry isn’t as precious as wildly popular tiny French macarons, and doesn’t have the cutesy appeal of a frosted cupcake, but kouign amann has the most important characteristic of all: unequaled flavor. “They’re my favorite thing ever,” says Flour Bakery co-owner Joanne Chang. At first glance, you might mistake kouign amann for a crusty golden muffin. Look a little closer and you’ll see that the little bronzed cake wears a crown with four points, or a four-leaf clover design. When you tear into one, there are layers upon layers of buttery dough. “It’s a croissant that has extra butter and extra sugar, which ends up caramelizing for a crisp outside,” says Chang, who also co-owns the Asian restaurant Myers & Chang. Kouign amann, from the words cake (kouign) and butter (amann), look innocent enough, but one bite is all it takes to fall unabashedly in love with the pastry’s crispy, caramelized sugar coating and soft, buttery dough. The confection is now being made by some top pastry chefs and popping up in bakery cases and restaurants around town, including Chang’s Flour bakeries in Fort Point, Back Bay, and Cambridge, Ames Street Deli and Loyal Nine in Cambridge, Towne Stove and Spirits in Back Bay, and Market Square Bakehouse in Amesbury. Kouign amann is made with a yeasted laminated dough, lamination being the process of incorporating a slab of butter into dough, with successive rolling, folding, and rotating (the three-step process is called a “turn”) to create dozens of layers. This is what gives croissants, puff pastry, and some Danish pastries their characteristic flaky texture. With the Breton specialty, the final two turns include a generous sprinkling of sugar. 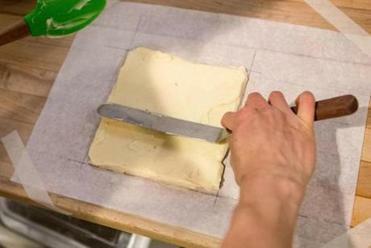 Home bakers can try their hand at making them, as some bloggers and websites demonstrate, but this pastry is best left to professionals with the time, space, and patience to turn them out day after day. That’s what Kudayarova and her husband, Tse Wei Lim, decided when they opened Ames Street Deli last fall. “We woke up one morning and said let’s make some kouign amann,” says Lim. The couple, who also own Somerville’s Journeyman and Backbar and Cambridge’s Study, took two months to get the recipe just right. For flavor “a little more complex,” says Kudayarova, they fold a dollop of white miso into the butter. “It adds a bit of a taste of fermentation,” she says. Dough rolled out and placed in mold. At Ames Street, Lim demonstrates how he makes the pastries, starting with a simple yeast dough. After it rises and chills, he rolls it into a large square and sets a cold slab of butter on top. He folds the dough over the butter to enclose it, and then the fun begins. 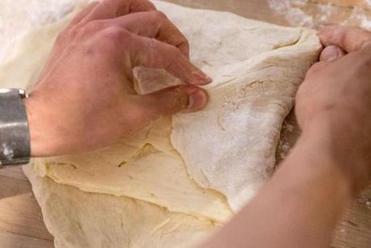 After gently pounding and rolling the dough into a long rectangle, Lim folds it into thirds like a business letter. This is done three times. These small, individual cakes are sometimes called kouignettes. 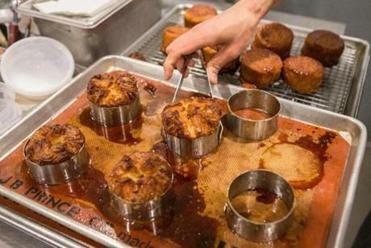 Traditional Breton kouign amann are cake-size disks, and this is the style that pastry chef Christen Umenhofer makes for weekend brunch at Towne Stove and Spirits. The golden disks are cut into wedges and typically served with berries. “Who doesn’t love butter and sugar and something crispy?” asks Lydia Shire, chef-owner of Scampo and consulting chef at Towne. At Cambridge’s Loyal Nine, chef-owner Marc Sheehan says the pastry has been a “work in progress as to how we wanted it to look and taste.” Pastry chef Adam Ross initially made what they called “salted butter cakes” but the appearance and texture of the squares wasn’t consistent. Now the cafe’s “winkle rolls” are shaped like snails from strips of dough coiled into muffin cups. The name is a playful reference to the restaurant’s savory dish of periwinkles. 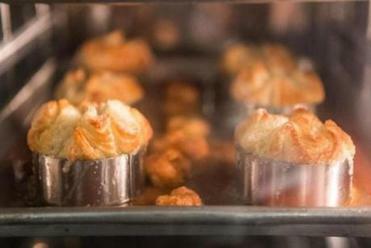 You can find tasty varieties of kouign amann at Amesbury’s Market Square Bakehouse, where new pastry chef and part-owner Angela Gonthier is making the special confections in muffin and jumbo sizes many days. 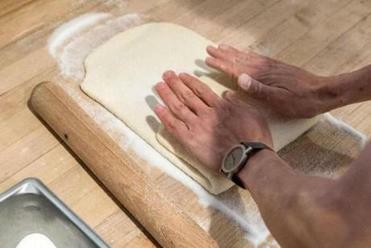 At the Newburyport and Portsmouth, N.H., farmers’ market on weekends, the Figtree Kitchen stand features kouign amann. Co-owner and self-taught baker Brian Murphy has been making the pastry for five years, bringing eight to 10 dozen to each market and selling out by noon. “You watch someone eat one if it’s the first time and they almost always come back and buy more,” says Murphy. And there’s the rub. Because kouign amann are so labor- and time-intensive, places like Flour and Ames Street Deli currently make one batch — just 12 — each day, so the first dozen customers luck out. “They go in about an hour,” says Chang, who is planning to increase production to two dozen. So if you want to try one or you’ve already fallen in love, set your alarm. To see an instructive video on kouign amann go to www.chefsteps.com. Recipes are also available at www.thekitchn.com; www.davidlebovitz.com; and www.bonappetit.com. mornings at 1 Junkins Ave., Portsmouth, N.H.